The third annual IndieWebCamp was held from June 22 - 23 in Portland (OR), right after Open Source Bridge 2013. We should all own the content we're creating, rather than just posting to third-party content silos. Publish on your own domain, and syndicate out to silos. 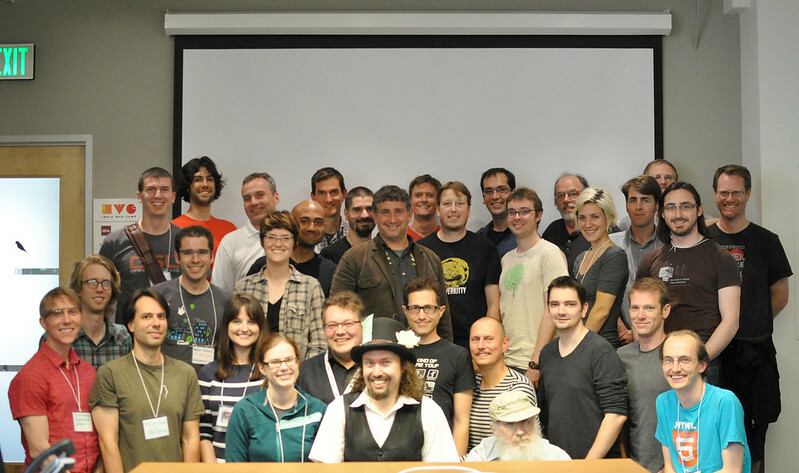 Two days of brainstorming & creating at IndieWebCamp 2013 and advancing & growing the indie web. at Elemental Technologies, 225 SW Broadway, Suite 600 Portland, Oregon. Also consider signing up for Open Source Bridge, June 18-21, 2013 also in Portland (register for OSBridge 2013 on Eventbrite). Indiewebcamp has a strong tradition of remote participation, typically utilising IRC, google hangouts and etherpad during as well as after the event. If you can’t get to the Portland event, consider remote participating or finding/running an indiewebcamp remote party near you. Flights: If you're flying from the SF/Bay Area to Portland (PDX), Alaska, Southwest, and Virgin America are recommended and have frequent flights to PDX. See buttons and put one your blog/site sidebar for IndieWebCamp 2013! Pre-party - thanks to idno! Venue - thanks to Elemental Technologies! Coffee Saturday - thanks to Mozilla! Dinner Saturday - thanks to Google! Coffee Sunday - thanks to Mozilla! Superfeedr makes RSS feeds realtime by pushing them from publishers to subscribers. We provide both an XMPP and PubSubHubbub/Webhook API and we believe *subscribing* is a key aspect of the IndieWeb. As a user I want to be able to follow my friends on the platform they chose, from the platform I choose! idno. is a flexible, IndieWeb-compatible platform for building personal and community sites. Network Redux is a Web Hosting and data service provider based in Portland, Oregon. Elemental Technologies is graciously hosting the 2013 event. Put suggestions for Indie Web Camp 2013 here. This is our unordered "to-do" (GTD next-actions) list for IndieWebCamp 2013. Strike and sign done items and move them to the done section. Let's move and organize most of these to 2013/Planning. create Calagator event and add it to the lanyrd, plancast links above (and on Main_Page and on Guest_List. create the 2013/Sessions and 2013/Schedule pages from 2012 equivalents. Add target audience (Who is this event for?) for web developers & designers. Find Sponsors, advertise them through Twitter. Add Login / Register on top left of nav bar, so it's easier to find. Process Andi Galpern's https://docs.google.com/document/d/1mKHAbNfTtyGeVte1WawBPAWHzs_NHwVrsVftZ5OR3iI/edit into discrete inline actions here. be sure to include Name, URL, other URLs (gtalk, twitter, github), and "IndieWebCamp.com/2013" on it. See also the overall to-do page for IndieWebCamp.com in general. This page was last edited on 24 February 2016, at 10:58.